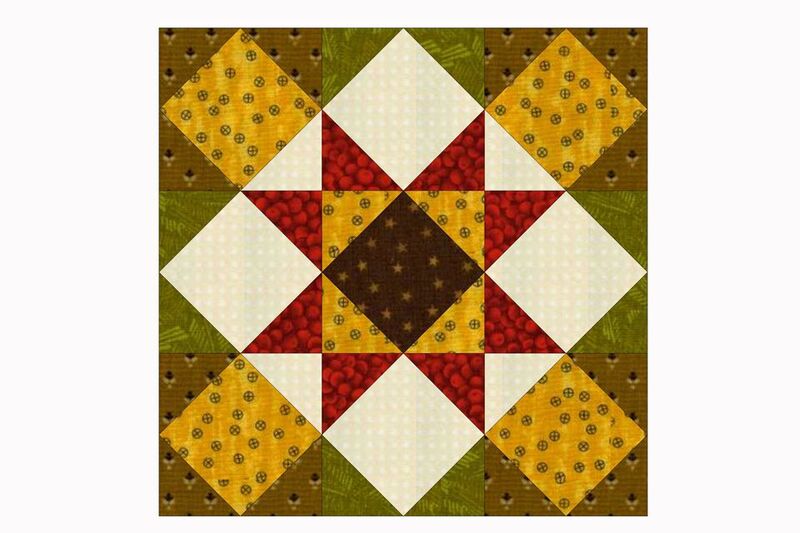 Kansas Star is a quilt block pattern that's also been called Eight Points Allover. The block's name is sometimes based on the color values used within specific areas of the design. Historians aren't sure, but the name Kansas Star may have been chosen for the pattern when writers at The Kansas City Star decided to share their version of the pattern. There are many ways to construct Kansas Star. One of the easiest ways to assemble the quilt block is to sew it with nine square-in-a-square units. The 6" square Kansas Star is one of the quilt blocks used for the Backwards Medallion Sampler quilt pattern, but feel free to use the pattern for any quilt you would like to make. We've included cutting for a 12" square block, too. The yardages on page 2 of the Medallion Sampler project are somewhat generous—enough so that you can include a scattering of those fabrics if you would like to repeat them within the quilt blocks. Individual patches for the 6" block are fairly small, so it's usually best to avoid large prints. We recommend you use a combination of print scales for interest, plus a few tone on tone fabrics, which add a subtle visual texture without overwhelming the layout. Quilting fabrics recommended below reflect the quilt block on this page— your choice of color and color value (contrast) may be different. Play up the inner star or let other elements be the primary focus. See page 3 for another example of a color layout for this easy quilt block. Components are listed by area to help insert your own choices. Smaller squares are used to create corner triangles, and larger squares become the centers of square-in-a-square quilt blocks. Stack each group of fabrics together to help keep fabrics organized. Read How to Choose Quilting Fabrics if you're a beginning quilter. The Kansas Star quilt block is made up of nine square-in-a-square patchwork units. We'll use the quick pieced Snowball technique to assemble the patchwork. Read through the Snowball quilt block construction instructions before beginning if you aren't familiar with this method. The top row of the illustration shows how one corner is added to a square. Gather the stack of fabrics cut for corner square-in-a-square units. Draw a line from one corner to the opposite corner on each of the smaller squares. Top left illustration. Align a marked square in the upper right corner of a larger square, placing right sides together. Sew a seam directly on the marked line. Trim away the excess fabric 1/4" from the seam (top middle illustration). Flip the corner fabric right side up, top right illustration, and carefully press into place. Take care not to stretch the fabrics. Use the same technique to sew a square to the opposite corner. Sew remaining two corners. Press the unit. It should measure 2-1/2" x 2-1/2". Make a total of four identical units. Repeat to make four square-in-a-square units for row midpoints. Repeat to create the square-in-a-square unit needed for the block's center. Once you're familiar with the technique, use chain piecing to create the units more quickly. Arrange the square-in-a-square units into three rows of three units each. Sew units in each row together. Press seam allowances in adjoining rows in opposite directions and then join the rows. Press. The quilt block should measure 6-1/2" x 6-1/2" (or 12-1/2" x 12-1/2"). Vary the Kansas Star quilt block in any way you like. Its final look depends on your use of color and contrast within the block. Make the star tips emerge with dominant colors or use similarly-valued fabrics along the diagonals to create more of a diagonal flow. An example of the Backwards Medallion Sampler quilt shown with the Kansas Star quilt block positioned in one of the areas for 6" quilt blocks.